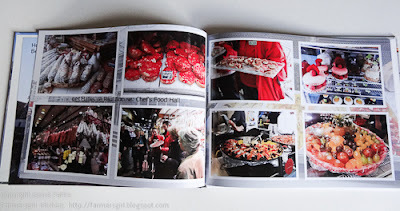 Have you have looked at photobooks in online advertising and thought, what a great idea they are? I have, but have never quite got round to uploading my photos and purchasing a photobook. 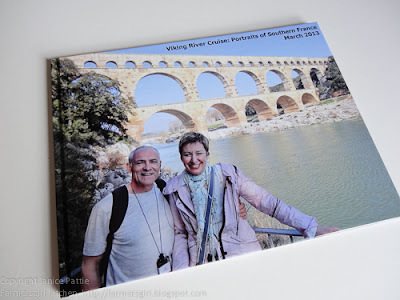 We were recently on a river cruise in the south of France so I was delighted when Vistaprint contacted me and asked me to review one of their photobooks, and even more delighted when I received the photobook, what a superb memento of our holiday. Vistaprint is Europe's largest printing specialist with a wide range of products. There are two ways you can work with Vistaprint, you can either upload the photos directly the online photo editor, or download the special software. I decided to download the software which turned out to be really easy to use and I liked being able to work offline.There are various different sizes of photobook with different options for the cover and paper. You can have your photos automatically placed in your book or choose where to place them yourself. I chose to place my own photos in the book. Sometimes I used the provided templates but it's easy to move them around or delete them from the page and add a full page photo. I was also delighted with the way you could place a photo in the background and it would show faded. Of course, I had far too many photos of food! Which is why I created this double page packed with photos from a huge food hall in Lyon. 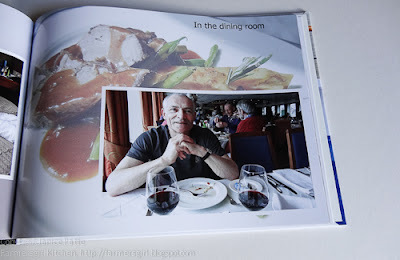 I also used a photo of a plate of food as a background for this photograph in the dining room of the river boat. I chose the option of a photo cover and, as well as a photo on the front cover, there is space for a a photo on the back cover. The photobook I chose was the 'Large Landscape' which is 28cm x 21cm and currently costs £10.49. People use photo books for a variety of things, such as capturing pictures of their holidays, creating wedding albums, as well as people using them as a creative way to keep hold of their precious recipes. Because you can insert images and text, it's a nice way to compile all your favourite recipes into a nice presentable book. You can then give them to friends as gifts, VistaPrint have even heard of one mum sending her daughter off to university with a basic recipe book! 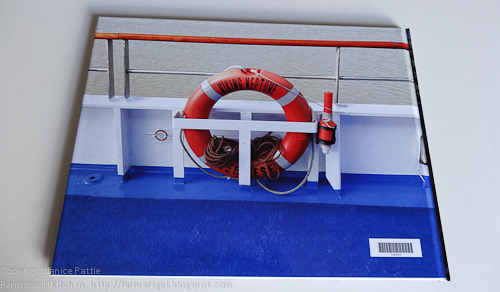 Not only can you make photo books with Vistaprint there are lots of other ideas like calendars mugs, photo magnets and even a photo iPhone cover. If you are a blogger you might also want to have a look at their business cards to help promote your blog at foodie events. 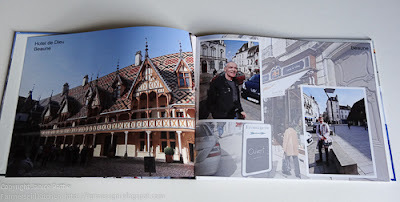 I reviewed the process of making a photo book with Vistaprint and received the finished book in return. I was not paid for this review and all opinons are my own. Lovely review. I keep meaning to do one of these with photos of my granddaughter as she grows up and I think thats a reasonable price too.